A man and a woman are standing and are engaged in conversation. The man holds a smartphone. Man: Wow! Just got my new iPhone 7! Woman: They skipped 6 and went to 7? 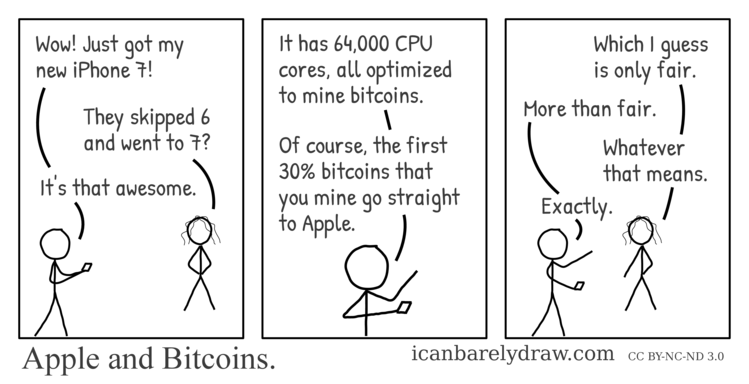 Man: It has 64,000 CPU cores, all optimized to mine bitcoins. Man: Of course, the first 30% bitcoins that you mine go straight to Apple. Woman: Which I guess is only fair.